Book research can take you in many directions. My fellow Inkies visit museums, historical sites, and reenactments with great zeal. My research as a mystery writer, for the most part, has taken a darker tone. I’ve visited police stations, a morgue, and spent time poring over online autopsy results--which I won’t share now. But my newest work-in-progress ties into weddings, and while some of my research can be done online, I’ve recently become well acquainted with the onslaught of wedding-related reality shows on television, so I thought I’d give a run-down. Four Weddings (TLC) is a competition between four brides. They meet, attend each others’ weddings, and rate them for overall experience, dress, venue, and food. The winner wins a honeymoon. Judging, however, can be quite subjective, and criticism is often contradictory. Some are penalized if they’re too original, others for being too cookie cutter, some for being too plain, some for being too ostentatious, some for not having enough food, and others for having too much food. (I personally always think it’s better to have too much food, but apparently some disagree.) This show in particular would be a good one to watch if you’re planning a wedding (real or fictional), since original ideas abound. Some work, some don’t--but that’s the entertaining part of the show. Say Yes to the Dress (TLC) The start of a franchise of shows. Say Yes to the Dress focuses on NYC salon, Kleinfeld, where brides come from all over to choose designer dresses. Rock bottom prices start at around $1500 (which the consultants say is a challenging price point) to $10,000 and up, up, up. 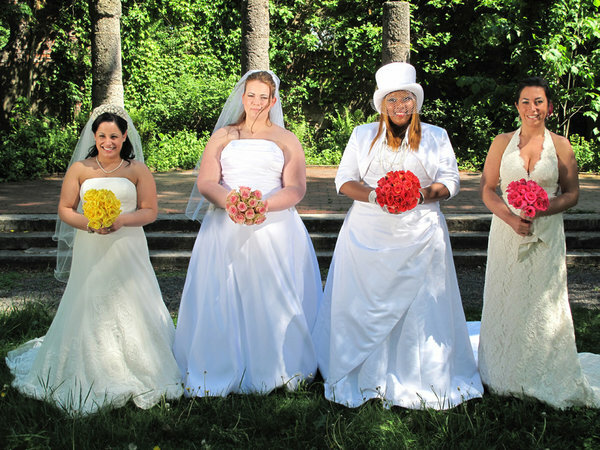 The show also features brides with personal and body issues, those seeking unusual dresses, celebrity brides (including several from other TLC shows) and brides of professional athletes. Say Yes to the Dress Atlanta (TLC) This is one of my favorites. This is the Southern version, complete with sassy and snarky bridal maven Lori Allen and her comic sidekick Monte. Here brides might come looking for anything from a couture gown to a dress that will go with their favorite pair of cowboy boots. Say Yes to the Dress: Bridesmaids (TLC) Filmed at the same place as Say Yes to the Dress: Atlanta, here brides come with their entourage and episodes showcase the angst of women everywhere--when you want to stand up for your friend’s wedding, but she chooses the most unflattering dress possible. Randy to the Rescue (TLC) Randy Fenoli, known for his work at Kleinfeld on Say Yes to the Dress, is on the road, taking wedding dresses, consultants, and hair and makeup people to brides in various cities across the country. Select brides will leave with not only their dress, but a detailed wedding blueprint they can use on their special day. Bridezillas (We) This is not the kind of show you watch to help plan your wedding. This is the kind of show you turn on to make your husband more appreciative of you. And a warning here: Bridezillas is not what I’d consider family-friendly viewing. Strong language, “adult” situations--and all around crazy behavior abound as completely self-absorbed, self-willed, self-centered, and often self-medicated brides-behaving-badly mow down everything and everybody in their path so they can have the wedding of their dreams. Which generally turns into a train wreck--at least for everyone else. I Found the Gown (TLC) is a more discount version of Say Yes to the Dress. Brides come to Vows, a Boston area salon that specializes in scouring the country for designer dresses at deeply discounted prices. Brides here are more price-conscious, looking for a bargain. Although bargain is relative. The average amount an American woman spends on her wedding dress is $800. The most inexpensive designer dresses, deeply discounted, are still generally more than this. My Fair Wedding (We) Bridal planner David Tutera steps in and transforms a wedding. Generally the bride has plans that are tacky, cheap, or just aren’t completely developed. Or maybe it was just the best they could do with a limited budget. But David steps in like a fairy god-planner, pampering the bride, choosing new bride and bridesmaid dresses, and pulling off an elaborate event reminiscent of Disney’s Magic Kingdom. In fact, I think he’s had something to do with planning Disney weddings. A new version, unveiled, shows episodes more rife with conflict, like the bride who wanted a burlesque wedding complete with red latex wedding dress with tassles on the…well, this is a family-friendly blog. Question: Do you have any favorite bridal shows? And let's talk about weddings. What are some of the best and worst you've seen? I love weddings! I just don't like wedding shows. I don't want to know about the snark. Now then... a cozy about an aspect of weddings ( I won't say more) is going to be a blast! okay - I admit I've been drawn in on some of those wedding shows. Not Bridezilla! but the 'sweeter versions'. I love seeing how the pros set up the dining room and facilities. I didn't know there were that many wedding shows on. A bit scary! No wonder girls expect more of weddings these days. Deb, while a great place to glean ideas, I think these shows may raise the bar too high. A lot of these weddings are decked out like state dinners of earlier decades. Personally, I like sweet and simple. They're a little off kilter, price-wise too. These are elaborate weddings. And that's OK when the people getting married are high-powered professionals and celebrities. But it breaks my heart when I see regular working folks mortgaging their future, spending tens of thousands of dollars, for a one-day event. I've watched the "say yes to the dress" shows and "four weddings." It absolutely astounds me how much people spend on weddings! How much are they putting into the marriage? The two favourite weddings I've been part of: my own (of course) where the budget for the whole thing was less than many of these dresses and people are still enthusiastic about the program at our reception four years later and my friend's wedding where she planned an entire wedding in one month (no she wasn't pregnant) and had everything she wanted! Two memorable small budget weddings! Suzie--I hear you about the research. Lately,I've let these shows play in the background while I do other things, and look up when I hear something interesting going on. Elaine, I'm right there with you about the simply planned, lower budget weddings. Because of a poorly timed job transfer (long story), my then fiance and I moved our wedding up--and I had to plan it in two weeks. Yet you would not believe the people who came up to me and said it was the sweetest wedding they've ever attended. Fortunately it was prom season and white was the in color that year, because my dress came right off the rack. We finished it off with a punch and cake reception. I'm not sure now that I'd do it any other way. some people put more effort into their wedding than their marriage. Deb, very true. I think some weddings even last longer, or at least seem to. The most elaborate wedding I've ever attended led to the shortest marriage. I think the attention on weddings in our culture is scary. If we spent half the time we did on the wedding planning for the marriage we'd have a much lower divorce rate. Very true. Right now I'm checking out a new-to-me series: Brides of Beverly Hills. Talk about excess.